Mad Ants Fall Intern Blog | Mad Ants fall intern Zachary Bigger will be keeping you updated about the latest and greatest happenings with the Mad Ants and around the NBA Development League during the Mad Ants season. Mad Ants fall intern Zachary Bigger will be keeping you updated about the latest and greatest happenings with the Mad Ants and around the NBA Development League during the Mad Ants season. Tonight at 7 p.m on their home floor in Allen War Memorial Coliseum, the Fort Wayne Mad Ants (1-4) take the floor to face off against the Iowa Energy (4-2) in their first Thursday game of the young season. The two have an extensive history playing against each other as Central Division foes before Fort Wayne was realigned to the Eastern Division this year. Fort Wayne sports an 8-6 all-time mark against the Iowa Energy at home, and will look to pick up its second win of the year against one of the most potent offensive attacks in the league. In terms of team statistics, Iowa ranks 3rd in the league in points per game at 115 points per contest, and are 5th in total rebounds per game at 47.5 per game. When they are on a roll, the team is hard to stop: Iowa has scored at least 120 points four times, and has gone 3-1 in those games, including a 133-123 shootout loss to the league’s best offense, the 8-0 Rio Grande Valley Vipers, in the game leading up to tonight’s matchup. Iowa is 4-1 overall on the road this season. This game is a great offensive matchup for Fort Wayne, which has started slowly out of the gate due to their struggles beyond the arc (28.2%, 14th in the league on a league low-14.4 attempts per game), the ability to get easy buckets (16th out of 17 teams in team assists per game), and a middle of the pack rating in turnovers per game (18.2, 10th overall). While some of that high figure has to do with the pace they play at and number of extra shot attempts they receive from their rebounding efforts, Iowa is not nearly as good on the defensive end, yielding 112.2 points per contest, 13th in the league. As a result, it should give the Mad Ants the opportunity to get going on offense and crack triple digits in scoring for the second time this season. Defense is where the Mad Ants have hung their hat on so far, racking up steals (12.8, 2nd in the league) and are in the top five in points surrendered per game with 100.4 per contest. Fort Wayne will need to contain the three point arc and capitalize in defensive rebounding situations given that Iowa is one of the worst teams in the league at generating second chance opportunities on offense. This begins with individuals such as forward Sadiel Rojas for the Mad Ants, who has been on a rebounding tear (3 straight games of 10+ rebounds) and has been pulling down 3 offensive rebounds per game. Besides Rojas, the Mad Ants have put in a collective team effort on the glass, with 6 players grabbing at least 4.8 rebounds per game. Fort Wayne will probably need to win the rebounding battle in order to get the win. Individually for players to watch on the Energy, it starts with former Miami Heat forward Jarvis Varnado. Acquired before this season in a trade with the Sioux Falls Skyforce, Varnado has lived up to the hype: he is 3rd on the team in points (16.3), 4th in the entire D-League in rebounds (11.7), and is an absolutely devastating shot blocker, rejecting 5.3 per game. His 5.3 blocks per game is 1st overall in the league after leading the league with 3.4 last season. To pair up with him, Iowa has the red hot Othyus Jeffers, a guard-forward who is 3rd in the league in scoring per game (25.5) thanks to his efficiency from the field (51.8%). Jeffers has attributes similar to a blank Scrabble tile: wherever you need help in a particular situation, he gets the job done for you. In addition to his scoring, he also brings rebounding (11.1 per game, 5th overall in the league), passing (4.2 assists), and creates important opportunities in transition thanks to his 2.2 steals per game. For the Mad Ants, the arrival of guard Bennie Lewis is an interesting story line to watch. Lewis, who prior to signing last week spent three seasons playing overseas, brought the ability to shoot beyond the arc in his first game in a Mad Ant uniform, knocking down 3 three point attempts. A critical need for Fort Wayne right now is space to operate on offense, and if Lewis can force defenders to come out to three point arc, it would help open up room on the floor for many of Fort Wayne players who look to drive to the rim to get their buckets such as forward Trey McKinney-Jones and D-League All-Star guard Ron Howard. After attending training camp on a loaded Indiana Pacers team and just missing out on a NBA roster spot, Howard has returned to Fort Wayne and continued his stellar play from the guard position. He is first on the team in points (23.0) and assists (3.0), and is 4th in rebounding while shooting a solid 44.8% from the field as the Mad Ants number one option on offense. He is assisted in carrying the scoring load by an emerging rookie, Trey McKinney-Jones. The forward is second on the team in points per game (18.0), and is coming off a spectacular performance against the Skyforce, playing 47 of a possible 50 minutes and posting a team season-high 30 points, snagging 6 boards, and coming up with 3 steals without turning the ball over. This entry was posted in Uncategorized and tagged Allen War Memorial Coliseum, Bennie Lewis, Iowa Energy, Jarvis Varnado, Othyus Jeffers, Ron Howard, Sadiel Rojas, Trey McKinney-Jones on December 12, 2013 by antsintern2013. Why? Grantland writer Zach Lowe does a great job of summarizing the case for this rule change. To quickly sum up what he is discussing: NBA game times are nearing Major League Baseball game times of almost three hours. Basketball is a game of rhythms and flows, not meant to drone on by the seemingly 537 TV timeouts during the game. While D-League games are shorter in length, the D-League is also the first place that the NBA tests new rules. With this extreme of a rule change, it will be tested in the D-League and not just decided to be implemented immediately at the start of a new season. Additionally, the reduced amount of game play will result in increased unpredictability, which is what any league wanting competitive parity wants. This increases the odds that any team can lose on any given night, and that nothing should be taken for granted. It will jam pack the action of a game and would require less of a time commitment for the fans, so they can enjoy the intensity of a game while not giving up an entire evening to view it. This idea was brought up by Kevin Arvonitz on his Truehoop video blog earlier this year, and I believe it is a great way to make every time someone touches the basketball, both sides have something to play for. NBA teams average 22.2 free throw attempts per game, about 11 per game by each side. Why not shorten this by rewarding good free throw shooters and punishing bad ones by make it one-and-one? The incorporation of a one-and-one free throw system would mean that players would not be standing around waiting for the first free throw to be taken. Second, it means that there would be less stoppage time in a game, shortening the overall time the game takes to be played. Third, it eliminates the easiest shot in the game, a standing still 15 footer where no one contests the shot and only one player is involved instead of the potential for many on either side with an assist, steal, block, etc. I believe this is necessary because today everyone has there free throw rituals, have to high five their teams, take a look at there friends, then finally take a shot. Lets try to speed the game up, not bog it down and ruin what makes basketball so special: a well flowing display of marksmanship and athleticism. The NBA three-point line unlike college (19′ 9”) and FIBA (22′ 1”) is not standard across the court, yet corner threes are worth the same amount of points. Three pointers continue to rise across the NBA as teams realize the value in them, with Miami attempting over 21 shots behind the arc per game. While teams nailing threes at high rates is great, why should the line in the corners be shorter than from the top of the arc? I believe the D-League should experiment taking away the corner three, because it is the best points per shot value of any shot in basketball. It would force teams to drive and slash to the hoop more often to get the other high value shots such as layups and dunks. The results would I believe increased showcasing of the great level of improvisation and athleticism in the D-League and NBA. This entry was posted in Uncategorized and tagged 40 minutes, corner three, NBA, NBA D League, one-and-one, rule changes on December 11, 2013 by antsintern2013. Playing 47 out of a possible 51 minutes, McKinney-Jones posted a stat line of 30 points, 6 rebounds, 2 assists, and 3 steals while not turning the ball over once. He was essential to keeping the Mad Ants in the game against Sioux Falls, and is leading the Mad Ants per game in minutes (35.8), is second in scoring (17.0), and is second in steals (2.2). The development and growth of the Miami (FL) product as he goes through his rookie season will be an intriguing story line to watch throughout this season. Rojas, last season’s total overall rebounder, in four games this season is averaging 10.5 rebounds, including 3 offensive rebounds per game. He has a streak of three consecutive double-digit rebounding games, and has seen his rebounds per game jump more than 4 rebounds per game. After playing in all 50 games last year following a devastating back injury as a rookie, Rojas has locked in and become a glass eater that any team would love to have. The newest acquisition of the Mad Ants which signed with the Mad Ants on December 3, played 21 minutes and added both a sweet stroke and athleticism off the bench. Lewis, who has played professionally for three seasons in Australia with the Melbourne Tigers, was a practice squad player for the Mad Ants for the first few weeks this season. Lewis was solid in his debut: he went 3 of 7 beyond the arc, grabbed 2 rebounds, dished out 3 assists, and a steal in 21 minutes. While his shooting overall (3 for 11) was not there Saturday night, if Lewis can make his mark behind the arc for the Ants, it would be a huge boost to a lackluster long distance attack so far. Come out and watch the Mad Ants in their third home game of the season at Allen War Memorial Coliseum Thursday night as they take on the Iowa Energy (4-2). Game time is set for 7:00 p.m. This entry was posted in Uncategorized and tagged Bennie Lewis, Fort Wayne Mad Ants, Sadiel Rojas, Sioux Falls Skyforce, Trey McKinney-Jones on December 10, 2013 by antsintern2013. In the league’s first season in 2001, Stephanie Ready served as an assistant on the first ever NBA Development league championship team, the Greensville Groove. Originally an assistant for Division I men’s collegiate basketball at Coppin State, she also was the second female coach to achieve that distinction. Bernadette Maddox broke the Division I men’s collegiate coaching barrier in 1990 under former University of Kentucky coach Rick Pitino. Ready is now a TV host and reporter for the NBA’s Charlotte Bobcats. The first female head coach of a men’s professional basketball team is Nancy Lieberman, who coached the Texas Legends to a 24-26 in their inaugural 2010 campaign and became just the third expansion team to make the playoffs in their first season. For the past two seasons, she has been the assistant general manager for the Legends. When the National Basketball Development League (NBDL) was formed in 2001, there were eight original franchises, all located in the southeastern region of the United States: the Asheville Attitude, Columbus Riverdragons, Fayetteville Patriots, Greensville Groove, Huntsville Flight, Mobile Revelers, and Roanoke Dazzle. Today, there are no teams located in the southeastern area, all 17 teams are located throughout every major geographical region except the southwest and southeast. All of the original eight having either been moved or folded, with Asheville (Tulsa 66ers) and Columbus (Austin Toros) still operating in the league today. Last year with the Indiana Pacers sending Miles Plumlee and Orlando Johnson to Fort Wayne for D-League assignment meant that all 30 NBA teams have sent a player on assignment since the league began instituting the assignment system prior to the 2005-2006 season. It was a major step towards seeing ever NBA team investing into the system, which will be essential to D-League President Dan Reed’s long term vision of a full 30 team minor league down the road. 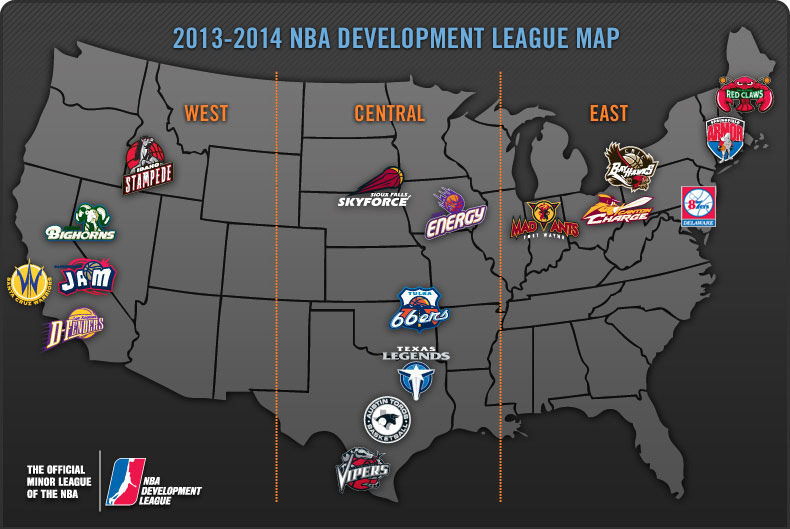 What originally was a rarity in minor league basketball is beginning to become a trend, especially in the D-League. Santa Cruz (Kaiser Permanente Arena), Sioux Falls (Sanford Sports Pentagon) and Bakersfield (Dignity Health Center) all constructing their own arenas in the past four years. This is important because it gives hope to mid-level markets who may not have a professional sports arena to obtain a D-League team already in place or may be chosen for expansion in the future. When the league began play in 2001, it signed two different TV contracts: the first on January 3, 2001 with ESPN for a 24 game package beginning with opening night and continuing through the regular season. The second with Fox Sports Net South on July 25, 2001 was for a multi-year agreement that would broadcast 19 games in the inaugural season. Fast forwarding to today, the league games are now simulcast online on YouTube and NBA Center Court app and on TV with CBS Sports Network and NBA TV. This entry was posted in Uncategorized and tagged Bakersfield Jam, ESPN, Indiana Pacers, Nancy Lieberman, NBA Center Court, NBDL, Orlando Johnson, Sioux Falls Skyforce, Stephanie Ready, Texas Legends on December 9, 2013 by antsintern2013. 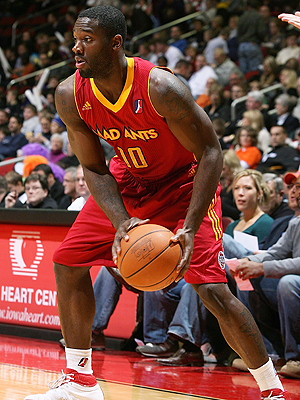 Rod Wilmont when he was with the Mad Ants. There was some laughter among the players on the court, and then the game resumed. These were the words of former Mad Ants player and IU star Rod Wilmont on June 17 during a pickup basketball game at Canterbury High School. The game itself was just for fun, with high scoring, as it went into the 130’s. That was just a pickup game. Wednesdays and Sundays, however, are a bit more serious, as those are the days that the Canterbury League is played on. The league recently had its title game for the first summer session back in July. A team named Glen Park winning it with an 11-1 record. 14 teams played in the first league, including a team of Mad Ants players: Tommy Smith, Anthony Harris, and Bryant Austin. However, the team stopped playing due to players going and playing with other teams for the summer. Ron Howard and Sadiel Rojas also played in the league, but with different teams. Currently, a new session is going on now that started on July 31, this one at SportOne Fieldhouse. As for the rules of the league, they play two 20-minute halves with a running clock, and they play by mostly high school rules. Teams get into a bonus for free throws at 7 fouls and double bonus at 10 fouls, and each player gets 6 fouls like the NBA. At the end of the season, there are playoffs, and every team gets to play, and they are seeded based on their record. So why was the league started? According to Wilmont, he wanted something that was more than just a recreational basketball league. 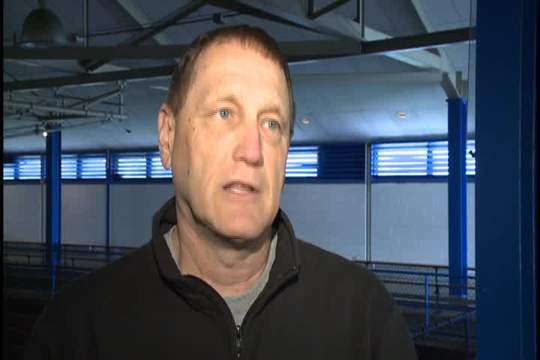 Looking for a solution, Wilmont turned to Canterbury High School Head Coach Scott Krieger to talk about the possibility of starting a summer league that would have games played in the gym. It wasn’t just Wilmont’s idea, though. One of his friends and former basketball player at Trinity Christian College in Palos Heights, Illinois, and founder of Total Package Elite (a basketball player development company) Chase Sanders, helped Wilmont in organizing the league. Sanders talked about wanting to play on a high school court because the Y, in his mind, it got too small with 6’5, 6’6 guys playing, as he put it. They wanted to at least start there. “We only started off with seven teams, and then people started hearing about it, and we ended up getting about fourteen teams. I know from my playing small college ball, there’s a lot of people that still didn’t know about it,” Sanders said in a phone interview. (He added that he hoped this story could get more attention out about it). One person who does know about it is Mad Ants President Jeff Potter, who also plays in the league. He says he likes to support his players, former and current, as much as possible. Plus there’s his own personal desire to play and stay in shape. Potter still shows flashes of brilliance, even hitting a game-winning jumper in one of the games, and said his turn-around jumper is his favorite move on the court. He also reminisced on his playing days, and says that he can’t quite get the itch of playing basketball to go away, and still enjoys being out there. “It’s the best exercise I think I can do, which is really what I’m after here, a good workout,” Potter said. Wilmont, as many Indiana University fans remember, was a reserve player for the Hoosiers, posting 10 double digit games, and led the bench in scoring on 18 occasions, according to his profile on the D League website. He was at IU from 2003-07, and after his college career, he played with the Mad Ants from 2007-11, and then had stints in Europe, including places such as Italy, Turkey, and Sweden to name a few. Most recently, Wilmont was hired on last November as the assistant coach of Canterbury High School’s boys basketball team to help alongside head coach Scott Krieger. Now, he hopes that his and Sanders’ newest venture will be something special, too, especially next year, when asked if he was hoping for the league to get media attention and more public recognition. “That’s my plan next year, to get a lot of sponsors, every team will have their own jerseys, and stuff like that. It kind of got put together all at once, but for next year, we have a foundation for where we want to be next year, so we’ll see how it goes from there,” Wilmont said. Sanders agrees, and hopes to have it be a summer league that fans will look forward to every year. He wants to model it off a popular summer league in California called the Drew League. In terms of the types of players that can play in the league, it’s open to anybody 18 and up as long as they come to play, as it’s a competitive league. You don’t have to be playing overseas, Sanders said, and added that even high school players have played in the league. Eventually, Sanders hopes for the league to be more exclusive if it grows large enough. He even thinks that there could be two leagues drawn up, too, with one competitive league of elite players and one that’s competitive with less athletic players. Potter hopes, too, that Wilmont and Sanders can turn the league into a successful business , and has seen signs of it starting to grow in popularity. This is especially so with seeing some Mad Ants fans going to cheer on the players that are participating in the league, Potter said. “There’s people showing up. It happens by word of mouth. We’ve had a few Mad Ants fans want to come see what’s going on. It takes time to build anything, but if it continues, I could see there definitely start to be bigger crowds,” Potter said. Sanders hopes to start something special, something he thinks Fort Wayne never really had. “I really think that this can be something really good because there really hasn’t been something like this in Fort Wayne. The goal is just to make it one of the top leagues to play in and be something that people will look forward to in the summertime and people can come out and watch some summer ball,” Sanders said. For more info on the league, you can check out their website, canterburyleague.weebly.com, or by contacting Chase Sanders or Rod Wilmont. Their contact information is listed below. This entry was posted in Behind the Scenes, Feature on August 7, 2013 by antsintern2013. Tony Mitchell had a dream season in 2012-13 as a rookie, earning the D League Rookie of the Year Award and helping the Mad Ants reach the playoffs for the first time in franchise history. 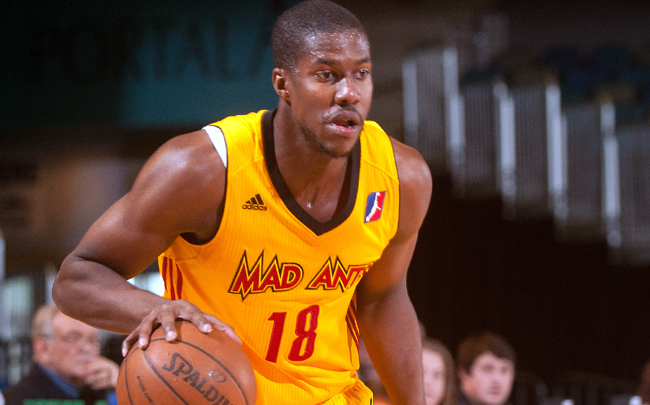 Mad Ants’ forward Tony Mitchell had a rookie season for the ages. He was named NBA D-League Rookie of the Year, won three D-League Player of the Week Awards, a D-League Player of the Month Award for March, and All D-League First Team Honors and All D-League Rookie First Team Honors. Plus, he helped the Mad Ants reach the postseason for the first time in franchise history with a 27-23 record. He also averaged 21.9 points/game during the season, and put up two 40+ point performances. One of them sent a game against the Austin Toros into triple overtime. Mitchell also had a stretch of nine games in which he scored over 20 points from Feb. 22-Mar. 15. Mitchell’s efforts earned him a spot on the Boston Celtics’ Orlando Summer League roster. He excelled, averaging 11.2 points per game and putting up 14, 15, and 16 point performances during his time there. He also spent time on the New York Knicks’ Las Vegas NBA Summer League roster, but he didn’t get as much playing time as he did in Orlando. Overall, having gotten the opportunity to compete in both Summer Leagues and having a shot at playing on an NBA team shows how far along he has come in his development. However, life wasn’t always this good for Mitchell. In his days at the University of Alabama, he was suspended indefinitely for “conduct detrimental to the team” during his junior season, and he did not get to come back for his senior season. Instead, Mitchell tried to get into the NBA Draft, and failed. After going to play with the Sacramento Kings’ summer league team, Mitchell signed on as a free agent, but was cut a month later, and then found the Mad Ants through Keith Smart, the former Indiana University basketball player who coached the Kings at the time. Smart reached out to Coach Duane Ticknor, who ended up taking Mitchell in, according to an article from AL.com, the website of the Birmingham News in Birmingham, Alabama. Assistant Coach Steve Gansey remembers the first time he saw Tony Mitchell when he came to the Mad Ants in November 2012, and saw that Mitchell had the body and athleticism to be an NBA player, but he wasn’t on an NBA roster, and that confused him. It wasn’t easy between all of them at first, Gansey noted, when Mitchell first arrived in Fort Wayne. “At first, it’s not that he struggled. He was just getting used to how he played and (he was) getting a feel for his teammates, coaches, everything like that, and for any player to jump onto a team who’s already been playing games and already had practices and all that…. It’s tough for anybody,” Gansey said. “It took probably a month for him to gain everybody’s trust, players and coaches, and even Jeff Potter, front office. After that, he got in better shape and knew exactly what we wanted from him every day, every game and practice and all that, and played very well for us, and won us a lot of games,” he said. Gansey said that he did know about Mitchell’s previous history at Alabama, and had made calls to people who knew Tony, and they told him that it wasn’t drastic or a huge problem. “Guys deserve second chances, too. You can’t get along with everybody, and everything can’t be perfect in the world, so we wanted to give Tony an opportunity and a chance, and it ended up working in our favor,” Gansey said. Mitchell ended up making a lot of progress from the time he first got to the Mad Ants to the end of the season, and Gansey attributed that to one word: confidence. “Every week, he got more confidence in his play, in his jump shot. He got more confidence in his teammates, and in his coaches, also,” Gansey said. It wasn’t easy, he said, as he, Tick, and Gansey got into it a few times, but Gansey says it was always positive. “I took Tony out and just wanted to give him a breather, because we wanted him to finish the game for us, and he wanted to stay in. It was little arguments like that where, ‘Listen, I know you can play 48 minutes a game, but we want you to finish and give it your all towards the end of the game rather than right now,” Gansey said. His conditioning also improved throughout the year, Gansey said as another reason for Mitchell’s success. In terms of Summer League play, Gansey said that he saw an NBA-caliber player when he played in Boston, and in Las Vegas, he didn’t get as much playing time. He told Mitchell to make the most of the time he got to play, whether for the whole game or only two minutes. The assistant coach also talked about the things he got to see at the Summer League. “He has the body, he has the athleticism. He didn’t shoot the ball very well in Orlando, but he played with those NBA guys. That’s the reason why they have Summer League. There’s players that play with these teams that are with those NBA teams and you get to see certain matchups, you get to see rookies, you get to see their draft picks go against guys like Tony Mitchell, and guys like Ron Howard, and see how they match up,” Gansey said. MItchell’s defense has been a concern for Gansey and the coaching staff, as he struggles with the concept of team defense, knowing his spot on the floor and having the trust in his teammates to fulfill their role. He does feel, however, that it has improved. As for joining the Celtics, Gansey believes Tony has a shot with them because they are looking for younger guys to help rebuild their team. He also says that people know that he’s good from watching him in the D League, and they know he can get better. “The Boston Celtics are looking to rebuild, and looking for younger guys who they can build up, and potentially have a future with, and I think Tony is one of those guys who can help an NBA basketball team,” Gansey said. When November rolls around, we’ll know for sure whether Tony Mitchell is in the NBA, or still with the Mad Ants. Regardless of where he ends up, Mitchell has seemed to turn the corner, and his future looks to be a bright one. This entry was posted in Behind the Scenes, Feature and tagged Boston Celtics, Mad Ants, NBA D League, NBA Summer League, Steve Gansey, Tony Mitchell on August 1, 2013 by antsintern2013. Former Mad Ants head coach Duane Ticknor was recently hired to be the Memphis Grizzlies’ assistant coach. He is one of several D League coaches to make the jump to the NBA this off-season. The recent hiring the Memphis Grizzlies made of former Mad Ants head coach Duane Ticknor is one of several moves this off-season of D League coaches and personnel getting a shot at the dream job of the NBA. It’s the dream of many people who work in sports, to get a chance to work at the professional level with the best of the best. Ticknor has that opportunity now to work in the NBA alongside David Joerger and the Grizzlies. Mad Ants President Jeff Potter discussed his feelings on Ticknor’s departure. Ticknor brought a lot of great qualities to the coaching role of the Mad Ants, which helped them achieve their first winning season and playoff appearance in franchise history. Assistant Coach Steve Gansey also appreciated what Coach Ticknor meant to him, and was elated for him to get the opportunity, but also sad that he wouldn’t be able to work with him anymore. “He gave me a lot of responsibility this past year in terms of our team, and I love that aspect of it,” Gansey said in an earlier interview. “I’m sad to see him go, but I’m also super excited for his opportunity to coach. Gansey also thinks he’ll do a great job in the NBA with the Grizzlies, especially with his coaching experience of coaching over 900 professional basketball games. The decision to take an opportunity in the NBA is certainly a tough decision for coaches in the D League like Ticknor, who develop a sense of loyalty and respect with their players, and even the community, and don’t want to leave them. At the same time, it’s an opportunity most coaches aspire to, and one that is difficult to turn down. Gansey talked about the difficulty he would face as a coach in that position. Going to the NBA for their next career move has been quite common this off-season for some D League coaches, including Nick Norse, who was recently hired as the new assistant coach for the Toronto Raptors, Jay Larranaga became an assistant for the Celtics, joining new head coach Brad Stevens; Nate Tibbets joined the Cavs, and Dave Joerger got hired as the new head coach of the Grizzlies, where Ticknor is now. Also, former Idaho Stampede assistant Scott Williams joined the Milwaukee Bucks new head coach Larry Drew, and former Austin Toros’ head coach Taylor Jenkins got hired as an assistant by the Atlanta Hawks. “It’s proving to be a great training ground for these guys,” Potter said in referring to the D League helping prepare coaches for working in the NBA. Gansey also agreed, saying the D League has become more popular every year, and more NBA teams are buying into it, and they’re getting better players. “I think NBA teams will continue to look at D League coaches as potential employers (employees), and I hope it continues to do that, because that’s where I want to be one day,” Gansey said. When the D League started back in 2001, there were only 2 coaches called up after the 2001-02 season, Bob Thornton, who became an assistant coach for the Chicago Bulls, and Alex English, who became an assistant coach for the Atlanta Hawks. Since then, 27+ coaches from the D League have gone on to become involved in the NBA as an assistant coach, video coordinator, scout, director of player personnel, director of basketball, and even general manager, in the case of Dell Demps, who was the GM of the Austin Toros, and is currently the GM of the New Orleans Pelicans (formerly the Hornets). So what kind of qualities does a D League coach need to get to the next level? Potter discussed his criteria for getting there, among them intelligence, preparation, and great communication skills. Along with that, he mentioned having a knowledge of the game, and especially work ethic. “You gotta work hard. You got long hours, you got (to have) dedication. It takes a long time to be prepared to beat those other teams, so those are the aspects I think would help,” he said. Gansey emphasized the ability to make quick adjustments, as a key quality for a D League coach to be successful and have a shot at the NBA. “I think one of the biggest things in the D League and with D League coaches strive on is, you’ll get new players every week. You gotta be able to think on the fly. Sometimes there’s players that come in two hours before the game time, and you gotta try to tell them in a small amount of time, your philosophies on offense and defense, and you gotta think on the run. I think that’s the biggest strength for D League coaches is that you have to make adjustments on the fly and you have to think quick with them,” Gansey said. Making it to the NBA is no easy task for D League coaches, and it took a long time for most of the new hires to finally make it there. The 2013-14 season will give them the chance to show fans, the media, and anyone who loves the NBA what they can do. This entry was posted in Feature and tagged D League, david joerger, Mad Ants, memphis grizzlies on July 26, 2013 by antsintern2013.